This is another of those sad and tragic cases that takes on a life of its own partially because the details of the investigation are being withheld until completed, but also because it’s been a slow month for news and the networks have blasted the hell out of this issue. As you might be aware if you read my posts enough to understand, I tend to try and use some measure of common sense. So given that I am getting as much information about this case as anyone else I will venture a few opinions here… and as we all know, everybody has one… or more. I personally find all these assumptions that Mr. Zimmerman “murdered” young Trayvon for racist reasons… the essence being a matter of racial profiling which led to Mr. Zimmerman allegedly attacking/confronting Trayvon… as pretty appalling. What I find most appalling is the typical yet demeaning response by national black leaders. Let’s break this down. As of this writing I have read, watched, perceived, evaluated, all the same information anyone else is privy to, and I have found absolutely nothing to even suggest one iota that there’s anything about this that is racial. Nothing. Nada. Now, this does not suggest that when all the investigations are completed that maybe some level of profiling could have had some role in all this… but as of yet I know of nothing to suggest it. 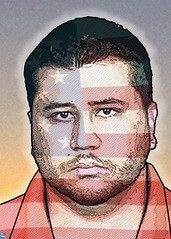 Heck, George Zimmerman, the alleged “murderer” (and what public information has determined that??) is Hispanic… and not white. While it’s completely possible for Hispanics to be racist you have to admit on some level it does seem that it might be a rare situation given being Hispanic and being profiled as such these days is a big issue as it relates to illegal immigration, that there might be some cultural tolerance between the minorities. But, ok.. even if Mr. Zimmerman was totally white… there is still nothing I have seen that suggests one bit that this is anything racial… nor racial profiling. Sometimes in life things just occur because things just occur. Sometimes timing of events are such that might suggest an ulterior motive might be at play but is really more benign. This case could very well be one of those situations. Let’s look at what we, as the public, do have as apparent fact. 1. The Florida “stand-your-ground” law prohibits the arrest or detention of any person who alleges to have taken the life of another person as an action of self-defense. 2. George Zimmerman had a lawfully registered weapon and a permit for conceal-and-carry of such weapon. 3. George Zimmerman, as part of his neighborhood watch duties, did contact the police to report a suspicious person. 4. George Zimmerman, apparently disregarding the “advice” of the police dispatcher to remain in the vehicle until the police arrive, leaves his vehicle to approach Trayvon Martin. (Note: In most police departments police dispatchers are NOT law enforcement officers and hence there is no obligation to accept their instructions as being lawful orders.) At this point we don’t know why Mr. Zimmerman left his vehicle to approach Trayvon Martin. 5. Phone recordings, witness interviews on the networks, and now a police report, all suggest that once Mr. Zimmerman confronted Trayvon Martin a struggle ensued which included audible cries for help followed by a single gunshot. 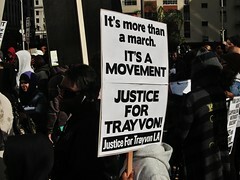 The result of that struggle left Trayvon dead and Mr. Zimmerman with facial wounds and a broken nose. 6. The police report is being released/leaked to the public as this is being written and it indicates the on scene investigation recommended that Mr. Zimmerman be charged in the least for manslaughter. The states attorney rejected that recommendation according to the stand-your-ground law… and Mr. Zimmerman has not been charged. Now my question is… where in all this is there any suggestion whatsoever of anything racial or racial profiling? Yes.. the parents are very understandably hurt and distraught and are looking for their own answers. I do not fault them for blaming anyone they choose to blame. I was a parent and I could very easily react the same way. But because the parents are groping for answers does not mean that the black community has to jump on the “racist” bandwagon and somehow equate this to some grand demonstration of illustrating the black struggle for civil rights. Jeeez. You got Sharpton down there and I see Jesse Jackson (who I guessed would get there soon enough). You got NAACP leaders down there in Florida and everyone else who wants news attention. Now, maybe because I am white and I will never feel what black people feel on having been enslaved or victims of racial hatred that I should have no opinion. For that matter, being white sort of makes me guilty of racial bigotry by race association, I suppose, given “my kind” whipped the slaves back in the day or something. But if the battle for civil rights is one to fight what makes this case the focal point of all things bad with racial profiling? If the Florida stand-your-ground law is wrong then get the damn thing repealed. But the law itself does not foster racism. It may be popular heresay to speculate that if Mr. Zimmerman were black and Trayvon was white that the black guy would end up arrested… but that’s not this case. My speculation on how all this might play out… well, there was obviously a fight and there would not have been a fight had Mr. Zimmerman stayed in the car (this will likely be the issue in a civil suit). I am guessing here but I suspect Mr. Zimmerman may have tried to touch or restrain Trayvon in some attempt to hold him for police. The young boy struck out in his own defense, not knowing who this guy was. Maybe Mr. Zimmerman’s nose got broken on the first swing by Trayvon.. which just infuriated Zimmeran all the more. The tussle continued until Zimmerman pulled out the gun and shot Traynor. Given my speculation on these events here I would speculate further that Zimmerman would be charged with manslaughter. I have no speculation what his sentence might be. Given the mood of the black community some jail time might be better for Mr. Zimmerman. As I mentioned, Zimmerman will likely loose any civil suit because if Florida conceal & carry is anything like Arizona or Nevada, just because you can carry does not mean you are immune from civil suit for using poor judgement, or any judgement for that matter. Also, as I mentioned earlier, he made the decision to leave his vehicle and thusly escalated the situation. Maybe if we had all this black attention focused on trying to gain support for Obamacare it would not be on the edge of extinction in the Court. This entry was posted in Politics & Religion, Social Issues, Social Unrest, Social Upheaval and tagged Black Panther, Florida, George Zimmerman, Racial profiling, Reverend, Trayvon Martin, United States, Zimmerman. Bookmark the permalink. This is again the case of the media looking for a story and not bothering to research the facts. They saw only that a white racist killed an innocent black teenager. I was taken back when i first saw Zimmeran listed as white. I had always thought him to be black or Hispanic. A simple Google search proved me correct. This can be summed up as sensational journalism at its best. Actually you are correct as I remember them (the press) mentioning Zimmerman was white as well… then they changed to Hispanic. Not sure I’m aware of any overt plan to separate the country by race and class. Who would even benefit from that?